Trim n Slim is your one stop solution to your weight loss and exercise programme! 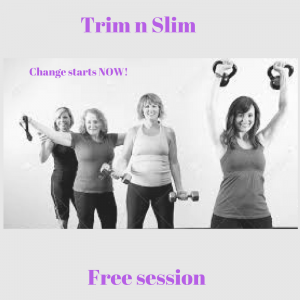 if you want to change the shape of your body then Trim n Slim is a perfect fit for you! No faddy diets, calorie counting or meal replacements, just a flexible plan to fit with your lifestyle. to long term weight management than calories in v calories out! “Having tried so many diets, I was pleased to hear of a new approach from a friend. She told me about Marie’s classes, but I was too self-conscious to go. Fortunately, she was running a taster session which I went to (with the support of my daughter). Marie was so welcoming and non-judgemental, giving me confidence that I could actually change my lifestyle. Her slim and trim class provided key information to teach portion size, sugars, healthy eating and making better food choices. The exercise classes were suited for all abilities with Marie giving various ways to carry them out. The meal plans have provided tasty nutritious meals that I could prepare in 30 minutes for the whole family. I would truly recommend Marie. If you have lost your way with what to eat and what exercises to do, go and see Marie – she will help you get back on track”. I started Marie’s course because I was at a time of life where I was struggling to maintain my weight – putting weight on was easy, losing it seemed like an uphill struggle! I liked the idea of no calorie counting and that it was an eating plan for life, creating new healthy habits – not just doing it for a limited time period after which you revert back to old unhealthy ways. The guidelines were simple to understand and involved specific tweaks to my current diet. Writing in the food diary kept me on track and support was always on hand from Marie, plus from the rest of the group at the weekly meetings and from the facebook group. Marie’s talks help me understand much more about how our bodies function and why certain good and bad eating habits affect us so much. I went along to Marie’s introduction to her class and was really motivated to join as it wasn’t just about losing weight, it was about changing your mindset and choosing the healthy food options. The menu planner was really useful as it didn’t read like a ‘diet’ it was a very helpful tool in changing my weekly menu and eating habits easily. I wasn’t too sure that I would have the motivation or will power to stick at it but at the end of the programme I had lost 5 llbs without really noticing! My measurements that were taken at the start of the programme had reduced too which was great. It wasn’t hard work at all and I think the chats with Marie each week, group support both at the weekly classes and online definitely helped. I would thoroughly recommend these classes and will be keeping the menu planners and regularly checking in to Marie’s Facebook page for handy tips and encouraging messages. If you would like to come along to one of the FREE trial sessions contact me to find out more.